This was a delicious meal. The combination of flavors was very nice. Mix the tamari or soy sauce, ginger and cayenne together add about 1/2 cup of water and place in a shallow bowl or dish. Slice the tempeh in half and each half, slice trough to make 4 thin, even portions. Lay the tempeh in the marinade for 15-30 minutes, flipping so that each side sits in the marinade. Make the vegetable broth in a small saucepan. Add the saffron threads to the bouillon and the turmeric. Allow the colors and flavors to infuse. Heat the oil and vegan margarine in a frying pan. Saute the onion until glassy. Add the rice and mix to coat the rice with the oil. Add the vegetable broth and cook the rice until most of the liquid has been absorbed. When the rice has absorbed most of the liquid and is soft, add the basil and walnut pieces. Place the lid on the rice and allow it to further absorb the liquid. Slice the top off the pineapple, then slice 4 more slices about 1/4 inch thick. Trim the edge off and the center circle that is often hard. If the pineapple is very ripe, then this center part is also soft and edible. Heat the oil in a frying pan and place the marinated tempeh in the pan to lightly brown on each side. Spoon a bit of the marinade over the tempeh. When the tempeh is done, remove from the pan, and place the pineapple slices in. They will only need a minute of to to lightly brown and soak up the marinade. If there is not any marinade left in the pan, spoon some over the pineapple. 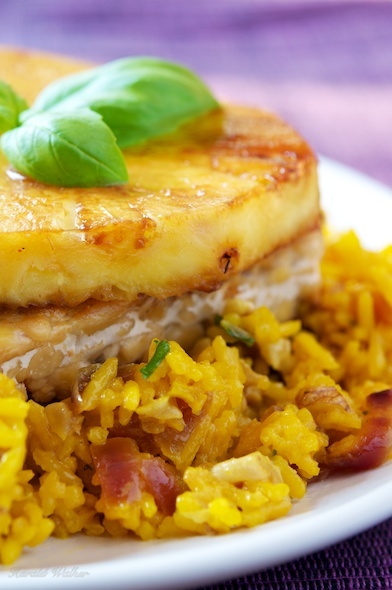 Serve the rice with pan seared tempeh and pineapple on top. 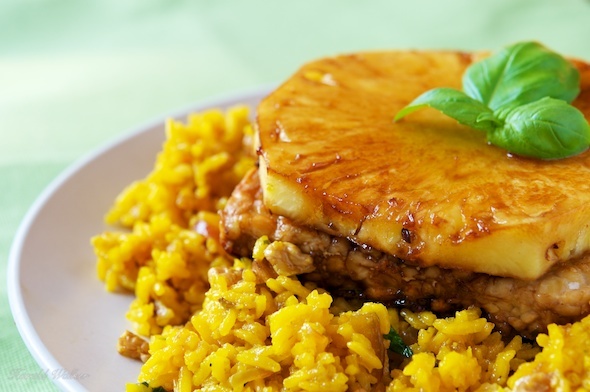 Posted by Chris Walker on June 1, 2012 in Main Dishes, Pineapple, Tempeh.